Tiki and Ronde were the stars of their Pee Wee football team, the Cave Springs Vikings. But middle school is much bigger than elementary school and it’s a whole different game—on and off the field. 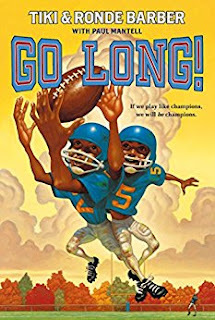 When Coach Spangler takes a job coaching for the high school team and Tiki’s old science teacher Mr. Wheeler is tapped for the middle school coaching job, the beginning of the school year and the football season is off to a bumpy start. But through working together, the boys discover that the whole team is bigger than any of its parts. The boys enter their second year of Junior High ready for their second season playing for football team, Hidden Valley Eagles. When their beloved coach needs to leave school the team is reluctant to accept the new coach, Sam Wheeler. Tiki, knowing Mr. Wheeler because he had him as a science teacher the prior year is ready to give him a chance. Coach Wheeler would do video sessions with the team which enabled them to see how other teams played which eventually helped them win and gain team acceptance. I think kids would like this book because it teaches them that you can still win even if you have a few loses.